Outdoor weddings are some of the most beautiful weddings. Not only do they incorporate nature, but they lend themselves to gorgeous lighting and beautiful scenery. There is almost always a great garden ,beautiful pond or simple field that can be utilized. Here, in south Louisiana, there are lots of parks with beautiful oak trees. Even backyard ponds and gardens are wonderful for smaller ceremonies. If the planning is right for the flowering season, you may get away with only needing flowers for the attendants and bride. The garden, or flowers surrounding a pond, will be more than enough “decoration”. Cut flowers from a neighbor’s yard or your own yard can also reduce the cost of the wedding. I have planned many such weddings. All were very different in the planning, but all were very cost effective, but beautiful. 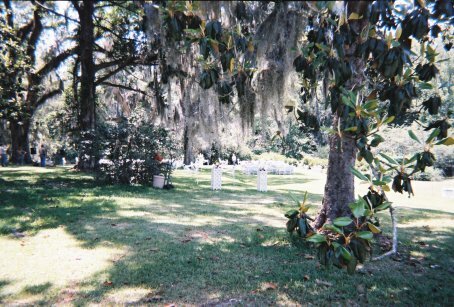 In the hotter months, it may be a good idea to have outdoor weddings under some large trees, or a pavilion of some sort, so that your guests don’t melt in the sun. Another option would be to plan it early in the morning or late in the afternoon or evening. An outdoor setting also lends itself to not having to have a reception in a different location. 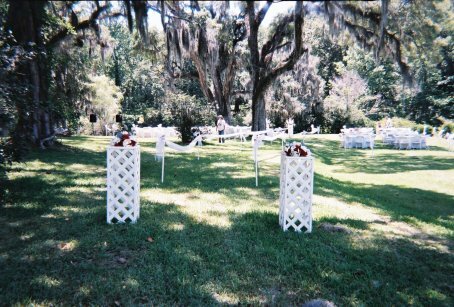 Again the setting saves money on decorations, because the same flowers, fabric and ribbon are used for both ceremony and reception areas. This is a very frugal option if you consider the considerable cost of flowers on the budget. Check out the link below for some great products including one of my favorite -- gossamer. Hair and makeup should also be thought through when the wedding is outdoors. A hot summer day could melt the makeup right off your face or sweat can wash it off. Wind can make your beautiful hairdo into a rat's nest, or even worse, give you a crazed woman look. There are lots of things to think about when planning an outdoor wedding that you don't have to when indoors, but with some strategic planning your wedding can be wonderful. CAUTION!! With an outdoor wedding there is always the chance of inclement weather. It would be wise to have a back-up plan. Perhaps a home, if the wedding is small, or a tent if the wedding is large. There are tents of varying sizes for rent from most party shops, but remember to calculate this into your budget, if you choose this option. Also be sure the tent is white or a suitable color. You wouldn't want a tent that makes you think of a circus! Have A Great Story and Photos of your outdoor Wedding?